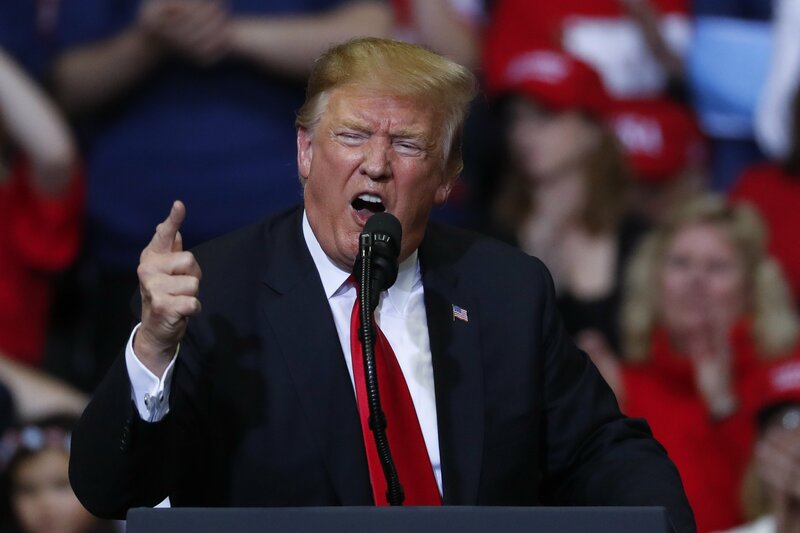 The rollicking 82-minute speech unfolded before a boisterous crowd in a key state that Trump swiped from Democrats in 2016. It marked his first political event since Attorney General William Barr released a summary that said special counsel Robert Mueller found no evidence that his campaign “conspired or coordinated” with the Russian government to influence the 2016 campaign. With the cloud of the probe largely lifted, Trump is hoping to win re-election by keeping Michigan and several other Rust Belt states in his column. “It’s going to be so much easier the second time: We’re one for one,” Trump boasted. The president linked Mueller’s probe with the myriad investigations launched by House Democrats and tried to make the case that, after Mueller’s findings, further inquiries are partisan overreach. “The Democrats now have to decide if they will continue to defraud the American public with this ridiculous bulls–t,” said Trump, who urged the opposing party to instead work with him on issues like infrastructure repair and drug pricing. While Trump’s base has long been suspicious of Mueller, the president’s team believes independents and moderate Democrats who backed him in the last election but have since soured may return to the fold if convinced he was unfairly targeted. Trump used the moment to heighten his attacks on the media, which many Trump supporters believe unjustly fanned the flames of the special counsel’s probe in an effort to bring down the president. Trump stood before a familiar backdrop: a giant American flag, signs reading “Jobs! Jobs! Jobs!” and, of course, “Make America Great Again.” Though the aftermath of the probe was at the forefront of his mind, Trump also ticked off what he portrayed as his administration’s accomplishments, including a booming stock market and victories over the Islamic State terror group. He also framed the Democrats’ presidential candidates as “radical,” and slammed the Green New Deal, an ambitious, wide-ranging plan to combat climate change, as a “dangerous” reinvention of American society. But he spent relatively little time on his administration’s renewed push to overturn the Affordable Care Act, other than to declare that the “Republican Party will be the party of health care.” He didn’t present many details as to what the new GOP plan might be. “For this week only, MAGA stands for Michael Avenatti got arrested,” Trump Jr. boomed, taunting the once-rumored presidential candidate. Loyal supporters started lining up in front of the Van Andel Arena on Wednesday evening, with some camping out in tents and sleeping bags overnight. By midafternoon, a crowd of thousands, many in red “Make America Great Again” hats, snaked for blocks around downtown Grand Rapids, just across the river from The Gerald Ford Presidential Museum. Trump’s sojourn to the Midwest is expected to be the first of many. His campaign is seeking to hold three key states that he swung from blue to red in 2016 — Michigan, Wisconsin and Pennsylvania — but that may prove difficult to hold after midterm elections showed rising Democratic energy. Still, advisers believe Trump’s core supporters remain enthusiastic heading into 2020. With an eye on local matters, Trump touted his support for the automobile industry and announced he would reverse part of his administration’s own budget plan, which had proposed a 90 percent spending cut for the Great Lakes Restoration Initiative. Trump said he would fully fund the cleanup program, offering the $300 million the program has typically received. Even before Thursday’s barnburner, Grand Rapids held a special place in Trump lore. On the eve of the 2016 election, Trump’s breakneck final blitz of rallies was meant to come to an end in Manchester, New Hampshire. But just days before, the Trump campaign tacked on one more rally in the western Michigan city after seeing data that showed a surge for their candidate. The Grand Rapids rally didn’t end until after midnight, bleeding into Election Day. Trump won Michigan by just 10,704 votes — his margins of victory in Wisconsin and Pennsylvania were similarly small — and those close to the president have long pointed to the rally as a reason for his victory.